Order a beautiful Caricature Drawing as a Retirement gift or gift on Farewell to a person, whom you want to support and surprise. Caricature will be drawn from photo in colored digital style. We will draw your person perfectly in front of any background concept of your choice. We can depict forest, sea, desert background and your person as sitting in any vehicle, garden seat or as staying and doing something. 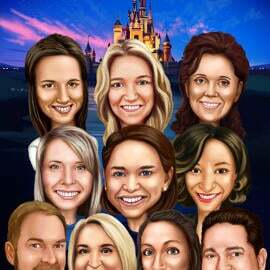 Caricature will be delivered as a printable JPG File on Email. Additional delivery options at extra cost: Caricature printed on Canvas, Caricature printed on Photo Paper. Worldwide shipping is available.